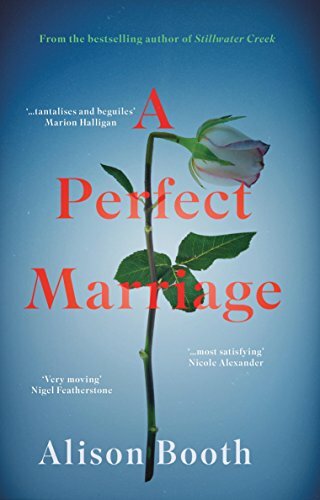 A Perfect Marriage is another of these books which wasn’t quite what I expected – but in a good way. From the title alone I thought it was going to be some kind of romance. The broken rose on the cover should have been a clue. Instead A Perfect Marriage, was a darker tale, a domestic drama if you like. Sally Lachlan has a secret from her past, a secret linked to her marriage, which haunts her. Two things combine to bring things to crisis point for her – she meets someone who reawakens romantic feelings in her, and her daughter, Charlie, begins to show interest in what happened to her late father and what kind of person he was. But with Sally unable to talk to even her therapist about what has happened, how will she come to terms with the past in order to move on in the present? The story is presented in a clever way. There are sections in the present as Sally meets Anthony at a conference and begins to tentatively form a relationship with him. It’s clear she is still troubled by her past though and will need to deal with this. I liked Sally and her friend Zoe very much and Sally’s mother was also a good character. There are also part of the book entitled ‘Then’. I must admit that I was a bit confused by these until I read on another blog that they were in fact working back in time and after that it all made perfect sense. The ‘Then’ sections were very cleverly written both in the way they followed from each ‘Now’ part and also in the way they gradually revealed what had been hinted at in the present. I thought that the ‘Then’ parts of the book were particularly well done. They had plenty of surprises and really explained Sally’s character and decisions in the present day. A Perfect Marriage is a book I found more compelling the further I read. I wanted to find out what exactly had happened in the past and whether Sally would find the closure she needed to be able to move on into the future. Great review. Sounds like the kind of book I’d like to read. I love dual time narratives and secrets from the past!